← Day 7 of New Rotation Albums List: “Get Well” by Birth of Joy!!! It’s been almost five years since the last “Billy Brandt and Sarana VerLin collaboration, “Goin’ Home.” (Pre Philby awards) That wait is now over! 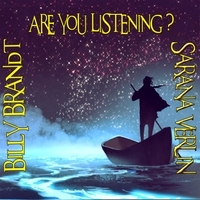 “Are You Listening?” by Billy Brandt and Sarana VerLin has just been released and it’s worth the wait. The album features well crafted songs that glisten with spirit as both Billy and Sarana alternate lead vocals and songs. The mix works incredibly well and almost feels like a “songwriters in the round” session. Brimming with confidence, “Are You Listening?” moves seamlessly from song to song. The opening track, “Ophelia” sets the pace for the whole album. It’s a haunting melody, perhaps inspired by her namesake in Shakespeare’s “Hamlet,” that features Sarana’s lighter lead vocals with Billy’s earthy harmonies offsetting, but complementing hers. They continue to swap lead and harmony throughout the album. “Judgment Day” covers territory similar to what Leonard Cohen mined on some of his last recordings. It’s not as bleak as his, but it’s definitely the grittiest song on the album. It’s kinda fun to hear both artists share their influences throughout the album. Brandt never steers too far from his folk/rock roots of The Byrds, Gram Parsons/The Flying Burrito Brothers, and The Grateful Dead, to name a few. Sarana has both classical, rock, and Celtic influences to draw upon, and they push each other to leave those influential comfort zones. I personally like what was done with “Sailing Away,” a medley of two separate tracks pushed together in the best George Martin compromise! There are so many great songs to choose from, but the artwork itself, put together by Sarana, is both mystical and interesting! “Are You Listening?” ponders the question. My advice is to say, “yes” and determine for yourself that this album is in an elite category! Check out my radio shows, “Theme Attic,” heard Wednesdays, 10A-12N ET, or “Prime Time Theme Attic,” heard Mondays, 8P-10P ET! This entry was posted in Album review and tagged Are You Listening?, Billy Brandt, Billy Brandt and Sarana VerLin, Can't Let Go, Everything's Falling, George Martin, Gram Parsons, Hamlet, Judgment Day, Leonard Cohen, Ophelia, Sailing Away, Sarana VerLin, Shakespeare, The Byrds, The Flying Burrito Brothers, The Grateful Dead, The Time is Now. Bookmark the permalink.